Earlier this afternoon GOV.UK released a new feature that shows a list of all the new and updated documents that have been published by a department or tagged to a policy topic, topical event or world location. Users of the HMRC What's New feed on the existing HMRC website will be familiar with the feed of latest updates to the HMRC site. 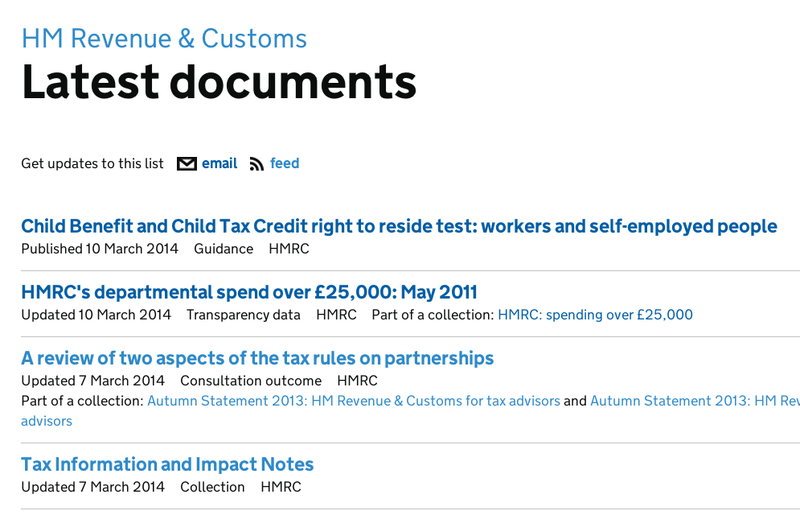 This new feature on GOV.UK will allow you to see a complete list of updated content by your choice of topic or department. The list is automatically generated from the content published or updated. See all updates on new documents tagged to the topic "Budget 2014"
Wherever you see a 'Latest' list, such as on the Budget 2014 topical event page, you will now also see an additional link 'See all'. Following this link will take you to a list of all the latest updates going back to the earliest documents published with that tag. For tax specialists, this means you can see all of the latest documents tagged to the Tax & Revenue topic page or the latest from HMRC. The Tax & Revenue topic page will ensure you see the latest on tax regardless of which department published it. We'd welcome your feedback on this feature. The latest feed will include any new content on the date it is published. Any existing content that gets updated with a major change, will reappear in the feed on the date it is updated. The content that appears in the latest feed is published by departments directly on GOV.UK (ie content in the Departments & Policy section of the site). This includes all the publications, announcements, consultations, and Detailed Guides). This doesn't currently include any of the content published by the Government Digital Service in the 'Services & Information' section of the site, but we are planning to include this in the future. If you're an editor or content designer using the whitehall publisher system, it's important that you remember to publish content in the correct content type and in the right category. If you make a change to a document, consider carefully whether this is a major change which should trigger an email alert and reappear in this feed. If you mark your update with only a minor change it will not appear in the list. If you're not sure, you should send through your questions to your local category manager or directly to the GDS team. Not being able to expand the 'latest' list to see older uploads has been frustrating. Thanks for adding the 'see all' functionality. Much appreciated. Following the link to 'Autumn Statement 2013: HM Revenue & Customs for tax advisors', I arrived at https://www.gov.uk/government/collections/autumn-statement-2013-hm-revenue-customs-for-tax-advisors . The list of stories are sometimes in date order, but not always. This means you have to hunt for what has changed. Could this be changed please? Also, a picky point, but we are advisers in the UK, rather than advisors. We do list the documents in date order, but when we publish an update, that item goes to the top of the list. This is to keep you aware of changes to existing content, as well as new content. And I'll try and change the spelling on 'Adviser'. Thanks for pointing it out. Kate, you are correct. 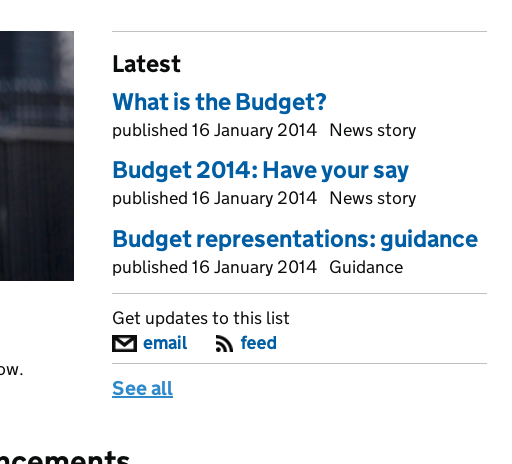 The What's new feed on GOV.UK only shows content published on GOV.UK. It is automatically generated from the content published on GOV.UK and has no awareness of any content that might be added to the existing HMRC site. Unfortunately, whilst transition is still in progress, it will be necessary to check both the HMRC site and the GOV.UK site.